Will Ignoring Construction Safety Be the Downfall of Your Business? In the construction industry, we’ve all had experiences with accidents and injuries on the job site. Whether it was an easily avoided injury or a terrible, tragic accident that left a family in mourning, the outcome is the same: lower productivity and work site morale, closures from inspections and investigations and additional expenses from worker’s comp, lawsuits, license losses and other costs that cut into what is often an already-slim margin of profit. The construction industry as a whole has a higher than average accident rate, with 20.3% of all work place fatalities taking place in our sector. 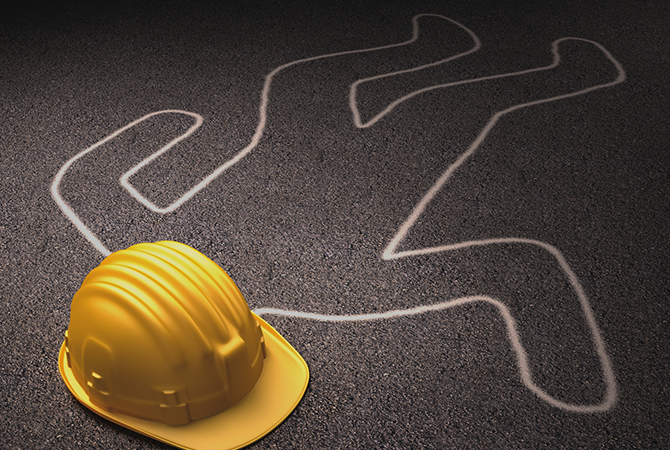 Of these fatalities, the great majority are from falls, accounting for 36.9% of construction site deaths in 2013. The next three causes of fatalities include being struck by an object (10.3%), electrocutions (8.9%) and being caught in or between something (2.6%) for a total of 21.8% of all construction deaths. One construction worker in ten has an accident on the job every year, with 60% of all construction accidents happening in the first year of employment. Over the length of a 45-year career, the average construction worker has a one in two hundred chance of dying on the job. These accidents cause lowered work site production through inspections, investigations and low crew morale. Job site and work shop accidents cause extensive expenses, including losing licenses, worker’s compensation and civil lawsuits. A 2012 study in Maryland found that construction accidents between 2008-2010 cost the economy $712.8 million. Another study found that the US economy pays $13 billion annually for construction accidents, with the average fatality costing $4 million and the average injury with time away from work averaging $42,000. But beyond general, industry-wide statistics, what does a work site accident actually cost? Here are a couple specific cases where a negligent employer faced serious penalties for not ensuring proper safety on a work site. These relatively recent accidents do not include potential wrongful death lawsuits pending from the victims’ families. In July 2014, Daniel Pohl, a 23-year-old father was electrocuted at Mission Viejo High School when the scaffolding he was working from came into contact with live wires. His employer, Five Star Plastering, was given six safety violations, one willfully serious, and faced proposed penalties of $164,275 in addition to civil actions that may be taken in the future. Off the Florida coast in 2014, an untrained diver doing construction for the City of Weston died due to a cave-in in a 12 foot deep excavation. Ric-Man International was found to be in willful violation of OSHA safety regulations that they had been warned about previously, resulting in proposed penalties of $161,000, not including any civil actions that were taken at the time. Both of these cases show how serious and costly on-the-job construction accidents can be. Is your business prepared to face these kinds of fines and disrepute? Most businesses don’t do well when faced with these types of cases. A better option is to take proactive measures to improve safety. Let’s take a couple minutes to look at what you can do, as a foreman, safety director or entrepreneur, to reduce the risk of liability and keep your workers safe on the job site. Make sure your employees have access to proper safety equipment if you provide it for your workers. If you require employees to purchase their own safety equipment, try to have some second-hand but sturdy safety equipment on the job site in case an employee forgets to bring theirs. Don’t forget safety features on your equipment! Make sure safety covers are in place and don’t let your workers operate equipment without the covers engaged. Falls are the most common and most preventable construction accident. Encourage the use of safety lines, railings and other equipment to help keep your workers safe. Slippery conditions are another cause of falls. Make sure to add traction through sand or grip tape to problem areas. Apply deicer to necessary surfaces in the winter. Another option to consider is improving your training program. Ensuring your employees have the correct training helps limit your liability in accidents where employees ignore their training. Visit the OSHA website for available materials on a wide variety of construction safety topics. Set up an apprenticeship program matching a new employee to a more experienced and safety-conscious one for a period of time. Bring in an outside company to provide safety training that is pertinent to your part of the industry. If possible, ask them to provide the training on your equipment. Offer awards, bonuses or perks to workers who put what they learn in training into practice in the field. The method that has the most effectiveness but can take the longest to build is your company culture. Don’t just talk safety, make sure you use your safety equipment as well, such as a hard hat, even if you’re just running a pizza into the job site for lunch. Praise employees who wear their safety equipment without having to be reminded. Develop a demerit system for those who forget or refuse to use their equipment. Push safety in your inter-departmental meetings. Make sure that every facet of your job considers safety first. Reward your employees for a particular number of days without accidents or provide bonuses to employees who have accident-free records. Now that you’ve got a few ideas of the risks, costs and ways to avoid construction site accidents, why not put a few into action? Schedule a training, develop reward systems, encourage employee participation or provide additional safety equipment to your workers. Remember, job site accidents cost more than just a hospital bill or hiring a new employee. If you have any questions or need suggestions to improve your safety program, please contact us. We’re happy to help make your worksite a safe one.